So seafoam through an intake with dirty valves = bad, because a chunk of carbon could potentially be broken free and then fly into the turbo or intercooler causing damage. Once I walnut blast my valves clean could I make it a routine to seafoam the intake via the below method every 500-1000 miles, therefore hopefully preventing the intakes from EVER getting dirty again? Would there be any harm in this? Would it actually keep the valves clean? I don't see carbon as a problem in a 2.4 as the only source of contaminant is the PCV and the air cleaner, so I have used Seafoam in both the gasoline and the oil on ALL my engines. on a 2.0 the ready source is from turbo lubricating oil. Every direct injection engine will eventually experience carbon deposits on the intake valves. Without fuel spraying onto the valves to keep them clean, they will foul. How soon or how bad depends on the engine and driving habits. Every manufacturer is experiencing intake carbon deposits since introducing DI engines. Some are fitting an injector in the intake port, in addition to the one in the cylinder, just to clean the valve with a spray of fuel. The type or quality of the fuel, and adding fuel additives does not reduce the buildup since no fuel travels through the intake passage. An oil catch can will reduce carbon deposits but finding one that actually removes oil vapor effectively is a challenge. Google oil catch can or DI engine carbon fouling. There are hundreds of posts, blogs and forum discussions about their effectiveness. And some pretty good arguments. 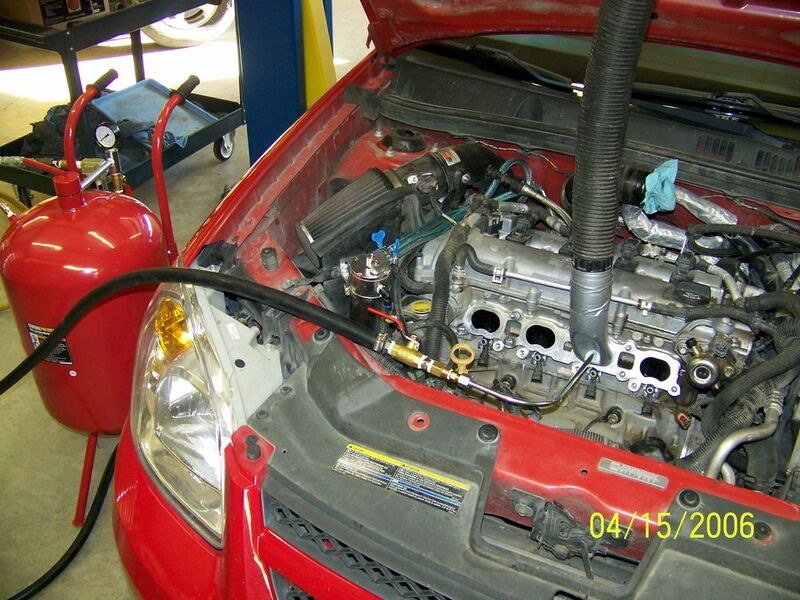 The problem adding an oil catch can to the 2.0 GXP engine is the inability to connect to the PCV system. The PCV valve is buried in the intake manifold and dumps crankcase gas directly into the manifold. Wife GXP or somebody else has modified the intake manifold to inable an external PCV valve and a catch can. There are pictures and a description on the forum. That modification is the best way to remove oil out of the crankcase vapor. I bought a spare intake manifold to be modified for the PVC relocation. Project # 798 out of 9,999 awaiting projects. I have a catch can on the turbo side valve cover to the charge pipe that hardly catches anything. It's not the ideal location since it only has vacuum during turbo boost. The PVC in the manifold has vacuum all the time except under turbo boost. That is the best location to add a catch can. Last edited by syjos; 02-11-2019 at 06:09 PM. I have little experience with repair or rebuild on DI engines. Old V8s? No sweat. Should LNF owners simply get a spare intake and head on hand and ready to go, and swap out clean vs dirty? No, I don't think so. The intake could be removed in 30-60min and once all supplies are on hand that are needed for cleaning, I don't think it will take that long, especially if you make an adapter like what Raygun linked a YouTube video of. I'm wondering if it's better to simply Seafoam the intake every 500-1000 miles, once the valves have been cleaned. Therefore...is it better to maintain them once cleaned, or clean them every 30,000 miles? The question would be - does seafoam actually clean the valves (valves with only 500-1000 miles on them) if sucked into the intake via a vacuum line? I'm guessing the only way to know would be to clean the valves, maintain them with Seafoam, then pull the intake after 10,000 miles to see if it's doing anything. Does Seafoam DAMAGE anything, if sucked in slowly and often? I was thinking along the same lines. A new head/valves for these engines is cheap enough ($300) that it's not inconceivable if you're willing to do all of the labor that goes along with it. Probably be a good time to do the timing chain/guides and any other upgrades you had in mind (valve springs, fuel lobe cam, etc.). That's an awful lot of work and expense switching out heads. In a few years, somebody will start a franchise specializing in cleaning DI valves. A lot of independent shops are into walnut blasting or scraping intakes. They charge a lot of money because it is time consuming with the equipment currently available. Someone with good old American ingenuity will invent a machine to clean the valves with ultrasonic pics similar to what dentists use. Or lasers, water jet etc. Might be, might not. An awful lot of work has different meanings, depending. I see ported heads for 1250 and bare heads for 300. Might be a bit of an investment in money the first time but then you'd have one head out and one in, and you're only cleaning it. edit- ah, he has 50 of them, I see. Yeah. It's a scam. Last edited by ChrisBlair; 02-10-2019 at 11:13 PM. Thanks for finding that! Mini Cooper Extraction Adapter ordered! found one on eBay for $70 with free shipping! @rob the elder the one I bought off eBay was $76 plus $5 shipping. The vendor is the exact vendor as who slaSh linked, ECS. If you found for $70, then you did better than me! Mine will be available for any club members use once I'm finished with it. Let's see some links to the eBay auctions you found. Also, is your purchase for BOTH tools or just the extraction adapter? Check this link for both on ECS. https://www.ecstuning.com/Search/Sit...ction_Adapter/ Compare your total pricing, please. Notice no shipping over $49.00 and they have sales all the time. The eBay item that I purchased from ECS is linked below. I did see the adapter but decided that it wouldn't work for the gravity gun that I purchased. I have something else in mind that I might be able to rig up as an adapter for less than $5. I'll be posting pictures when I perform the cleaning. As stated, EVERY manufacturer with a DI motor has this issue. EVERY manufacturer is trying to fix it. Hyundai has it so bad that they are trying to come up with a fix for this very quickly. They're tired of putting new heads on cars with 20k. It's cheaper for them to put a new head then pay the tech to clean the valves. Ghost - I'm not promoting Seafoam nor trying to fight you on the matter. I'm just trying to get information and learn. I'm not sure much seafoam gets into the crankcase by sucking it through a vacuum line on the intake, are you saying that enough gets in to make a difference? Enough to warrant a oil change? After a fair amount of googling and reading various forums, I can't find any direct link between a turbo or turbo seals being eaten from seafoam. I've read several people have issues with seafoaming an old engine, of which case it was most likely a large chunk of carbon breaking free. Would regular seafoaming prevent large chunks from ever developing? The safest answer is just to pull the intake and walnut blast the valves every 25k miles or so. An oil catch can located in the proper place may help reduce some buildup. I'm just curious if Seafoam can be used to help maintain already cleaned valves.